Shimla is the capital city of Himachal Pradesh. It is undoubtedly one of the most beautiful hill stations in India. Blessed with the exquisiteness of the nature it is the place with lofty mountains wrapped with the blanket of white snow. The Tours to Shimla gives you an opportunity to witness unbounded natural beauty that the city offers. 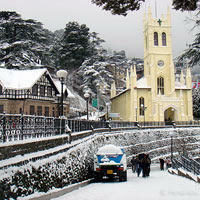 Some of the tourists Attractions in Shimla include Kali Bari Temple, Jakhoo Temples, state Museum, Prospect Hill etc. For the most pleasurable Shimla Hill Station Tour, we offer comprehensive Shimla Tour Packages to tourists. We are considered to be the most trusted Shimla Travel Guide in the country. This famous tourist attraction is a large open space in the middle of the city from where you can view the peaks of lofty mountains. Neo-Gothic structure of Christ Church and the new-Tudor library is also very popular among the tourists. This is the most important tourist destination of Shimla. People come here for shopping. It also has a restaurant, the Gaiety Theatre, which is a replica of an old British theatre are some of the major attraction of the place. Lakkar Bazaar near to the Ridge is also famous for its wood crafts and souvenirs. It is said that the Goddess Shayamla is enshrined in this temple. It is an ancient "Lord Hanuman" temple. You can hire pony or taxi to reach this temple. The Ancient Historical Sculptors and paintings of Himachal Pradesh are kept here. The Visiting hours are from 10 AM to 5 PM. It remains closed on Monday and holidays. This splendid English renaissance structure was formerly Viceregal Lodge. Entry is by ticket. A quaint hill stops on Shimla-Kalka Railway line. Mahatma Gandhi also lived in the elegant Georgian House of Raj Kumari Amrit Kaur. HP University is located here. The place is surrounded by lush green forests. About 45 minutes walk from Summer Hill Chowk. It is famous "Lord Hanuman" temple.The place can be visited by Bus/Taxi. On the India-Tibet road, Narkanda is situated which offers fantastic views of the snow ranges. A trekking through Deodar woods leads to Hatu Peak (8 Km) which has an ancient temple of Hatu Mata. HPTDC has Hotel Hatu here. Rampur is situated on the Hindustan Tibet Road on the banks of river Satluj. It was once the capital of the Princely State of Bushahr. It is a Big Commercial Centre and famous International Lavi fare is held in every November. Dumgir Buddhist Temple, Padam Palace, Raghunath Temple, Ayodhya temple and Narsingh Temple are famous attraction of the place. HPTDC has a tourist Complex and air conditioned CafÃ© here. Located on Hindustan Tibet Road the place offers spectacular view of Srikhand range.It has a majestic Bhimkali Temple. It is a famous religious shrine Giriganga.